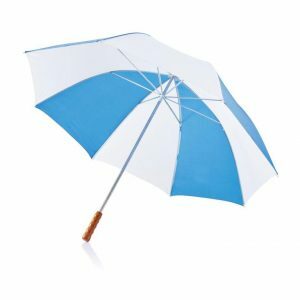 Straight Umbrella, Long Umbrella, Hotel Umbrella, Promotional Long Umbrella are synonyms to Golf Umbrellas. Golf Umbrella is available in 29” radius also known as arc of the umbrella. 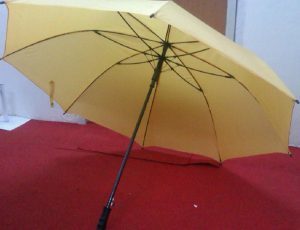 There are two kinds of mechanism in Golf Umbrellas, automatic and manual. Golf Umbrellas are also used by car companies as giveaways for sale of a car often considered as a souvenir. There are 3 fabric options in Golf Umbrellas stated as Polyester Taffeta, Nylon Taffeta and Polyester Pongee. 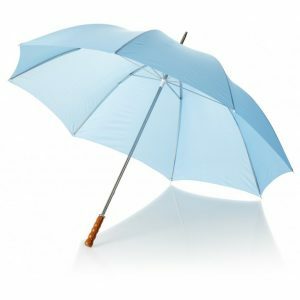 Out of all the products we manufacture Golf Umbrella is one such product which has the maximum coverage with the lowest amount spent. 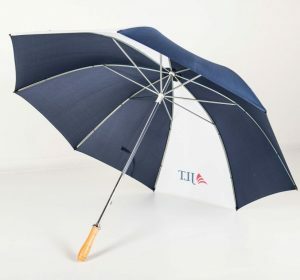 As the Golf Umbrella is of big size, the printing done on the fabric looks bold and attractive and easily visible to those who are standing at a long distance. We have always tried to promote industry by manufacturing raw materials in India and giving client durable product with a competitive price. Golf umbrella is not amongst those, we import the structure of Golf Umbrella from China and get it assembled at our unit, and this process is adopted by all the umbrella manufacturing companies in India as Golf Umbrella is one of the those products, which if manufactured in India could not be come up as finished as Chinese product and if also it comes then it will be very expensive. There are various range we manufacture in Golf Umbrellas like Customised Promotional Golf Umbrella, Customised Digital Printed Golf Umbrella, Customised Screen Printed Golf Umbrella, Customised Two Fold Umbrella, Customised Business Promotion Golf Umbrella, Customised Political Campaigning Golf Umbrella, Customised Men’s Golf Umbrella, Customised Gents Golf Umbrella, Customised Black Golf Umbrella, Customised Silver Coated Golf Umbrella, Customised Ladies Golf Umbrella, Customised Cheap Golf Umbrella, Customised Pharmaceutical Golf Umbrella.